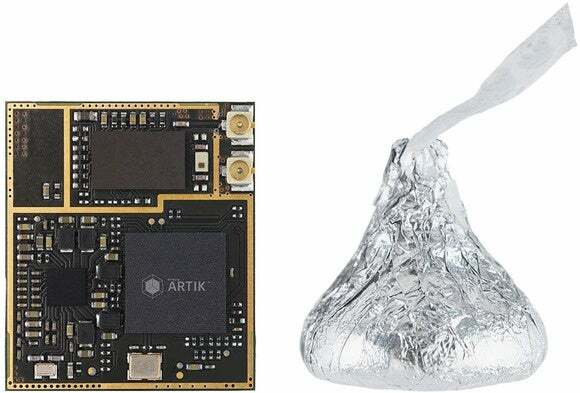 Samsung has started shipping its first Artik developer board, hoping it will find a place in robots, drones, wearables and a whole range of connected devices in the Internet of Things. The Artik 5, which looks like the Raspberry Pi 2, is an uncased computer with all the components mashed into a small circuit board. It is available for $99 from Digi-Key. It is the first board to ship out of the three Artik development boards announced last May. The two not yet available are the minuscule Artik 1, which is for wearables, and the larger Artik 10, which could be the guts of PCs, robots or even portable servers. The Artik 5 has a dual-core Cortex-A7 ARM processor, which is used in smartphones and wearables. It has a 720p graphics processor, 4GB of storage and 512MB of RAM. The connectivity features set the Artik 5 apart from rivals like Raspberry Pi. In addition to Bluetooth and Wi-Fi, it supports Google's Thread, a connectivity specification to link up IoT devices. Samsung has already voiced its support for Thread. Samsung has a grand plan to equip homes with Internet-connected appliances like refrigerators, ovens, washing machines and bulbs. Artik could help enthusiasts make smart devices that can plug into such an environment. The board will come pre-loaded with Linux-based Fedora OS. It's not clear yet if Artik supports Google's Brillo, an IoT development platform for connected home devices, which is closely tied to Thread. Intel's Edison developer board already supports Brillo. Samsung is also providing software tools, security features and services through its SAMI cloud platform. For example, a cloud service may decide when to turn an air conditioner on or off based on data collected from a smart meter. SAMI could allow sensor data to be fed into the cloud for analysis. Another interesting use of Artik could be for health and fitness. Data collected from a wearable can be sent for monitoring and analysis to Samsung's Simband cloud-based health analytics service. Samsung has also tied the Artik boards to driver assistance, service robots and cloud-based security services. The Artik boards are targeted at an audience that includes enthusiasts and startups developing IoT hardware. IBM, ARM and Microsoft are among the notable companies selling boards with access to cloud services. Raspberry Pi has no cloud service attached to it. The Artik boards are also part of an effort by Samsung to sell more components and services for IoT devices. Analysts have estimated the number of connected devices numbering anywhere from 20 billion to 50 billion devices by 2020. The Artik 5 is 29 by 25 millimeters. It has USB, GPIO, I2C, UART and SPI ports, which are critical for attaching components and peripherals like cameras. Samsung has said it will make Artik boards compatible with Arduino, a development platform popular with makers, but it's not clear if that has happened yet. The board is shipping ahead of the Samsung Developer Conference, which will be held in San Francisco on April 27 and 28. The Artik 1 and Artik 10 boards could ship prior to the conference.